I absolutely love planning-with paper planners. I love to make lists and attempt to stay organized. 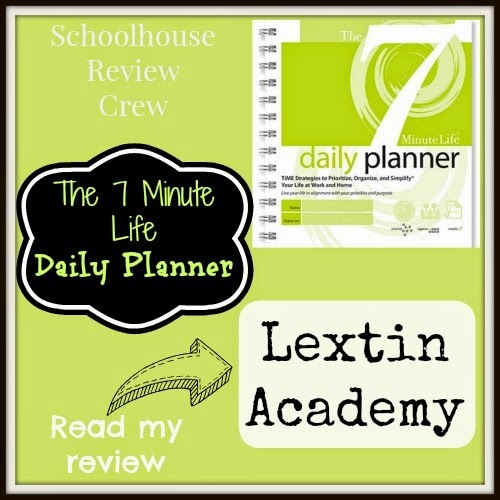 When I heard that I had the chance to review The 7 Minute Life Daily Planner from The 7 Minute Life I was thrilled to try something new to help plan for our new school year. The 7 Minute Life is a time management company created by Allyson Lewis, a motivational speaker and author of The 7 Minute Solution, The 7 Minute Difference, and The 7 Minute Daily Planner. Through her products, she encourages everyone to prioritize, organize, and simplify. The 7 Minute Life Daily Planner is a personal training tool to take an overwhelming to-do list and divide it into manageable tasks. Through the use of the planning pages outlined in this planner, priorities will be discovered, goals will be set, and manageable checklists will be created on a monthly and daily basis. This planner is designed to help you cut through the chaos, and in 7 minutes, discover your priorities and redefine your purpose. It contains planning pages to record goals, meeting plans, daily tasks, daily contacts, lists of unfinished tasks, and appointments. This planner is designed for use by adults, or in this case, moms. It is a 7.3″ by 8.5″ paper planner that is spiral bound. Here’s a helpful video to explain how the planner works. I definitely started with watching the videos and reading through the beginning section of the planner. It contains so many sections and so much information that I had to slowly work through the videos and the introduction before I could jump in. I finally took the plunge and started filling out the beginning sections of the planner. This section begins with a list of items to prioritize. Things like love, success, efficiency, relationships, connecting, travel, and health were among the many values listed. I spent time choosing which ones I felt were most important to me so I could begin to prioritize before I planned. Next I was directed to write out a purpose for my life and list what I loved and record some purpose words to help guide me. The following page had places to write what I loved at work, my strengths, my highest value activities, and how I liked to be rewarded. The next sections had pages to record 90-day goals for work, personal, financial, and life goals. The following pages had lines to record unfinished tasks as well as action steps to work toward completion of those tasks. There were also pages for an annual calendar, annual projects, monthly calendars, and meeting reports. Ok, so there was a lot to fill out before beginning the daily planning pages. I spent about a week working through the introduction and filling out the various sections of the planner. I didn’t quite get each page filled in but I felt it was time to jump right to the daily pages, knowing I could come back to the beginning at any time to make changes or to add tasks. I started to get a little overwhelmed with the many sections and blank pages that stared back at me. The daily pages include a section to record people you come into contact with, the 5 priority tasks to complete before 11 am, a list of people to connect with, unfinished tasks to complete, appointments, thank you notes to write, any expenditures from the day, and voice mails to return. 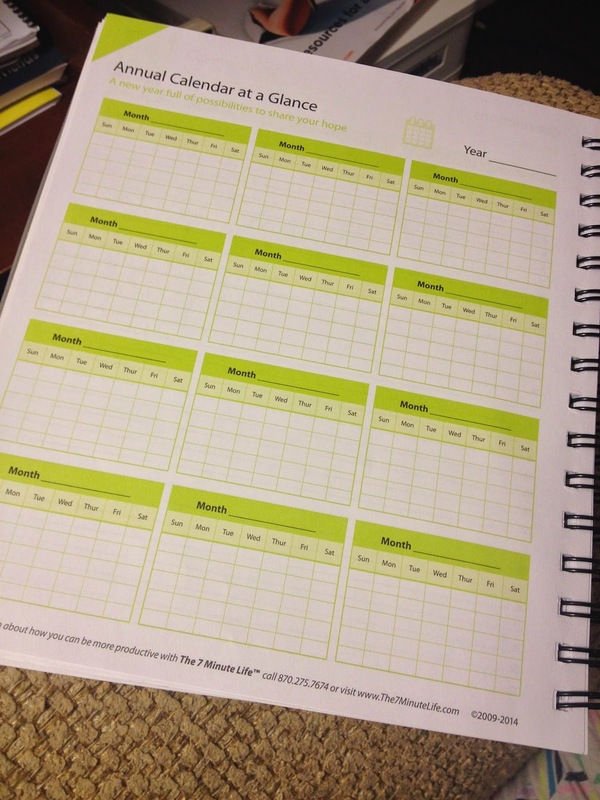 There is also a section for any extra notes as well as a place to record the amount of exercise, sleep, reflection, and reading done each day. Another portion of the daily planner has boxes to write down the meals for the day as well as track the number of glasses of water consumed. At the bottom of each day there is a question, “Did I do what I said I would do today?” and a box to check either yes or no. Each night I turned to a fresh page and started outlining tasks for the new day. And being the perfectionist that I am, I tried to fill in every line and space. It’s quite a lot of information and a lot of planning that goes into each page. You do have to plan with purpose and think strategically as you fill in each section. I love the idea of figuring out priorities and setting goals before you begin creating a monthly or daily calendar. It really helped me see that some things were simply not a priority and were wasting my time that could be spent on more important tasks. I really appreciated the page to help me discover my purpose where I wrote down things I love and some purpose words for myself. Some things I wrote that I loved were reading, blogging, lists, family time, and Bible study. My purpose words were disciple, consistent, balance, joy, efficiently, progress, and self-growth. Once I had discovered what was important to my purpose, I was able to plan more effectively. However, this process is not for the faint of heart as it was somewhat time consuming and overwhelming. I was thankful I had some videos to watch to help guide me during the process. Another section has places to record goals as well as action steps to assist in attaining that goal. This helped me write goals that were measurable and attainable. Then I felt compelled to start completing them! There is also a section to record the outcome of each goal. I loved that I had a place to journal the experience even if the goal was not attained. Looking back on goals and how I tried to achieve them would help me plan more effectively for the future. I found the annual calendar page as well as the monthly calendar pages to be somewhat small. I had a very difficult time writing in tasks or appointments on those small grids. It made for a messy calendar when I tried to read what I had written. I love being able to glance at the entire month and see the most important tasks recorded, but I really needed a bigger writing area. My favorite aspect of the daily progress report pages was the 5 before 11 section. This is a place to record 5 tasks of the utmost importance that need to be completed before 11 am that day. It was a good exercise for me to choose the top 5 tasks and write them in those spaces. I loved the sense of accomplishment I felt once I had checked off each of those tasks. However, I will freely admit that my 5 before 11 became my 5 before 3 pm, because I had to do most of the tasks while my youngest was napping in the afternoon. Mornings are not usually very productive for me and I’m trying to accept that fact! 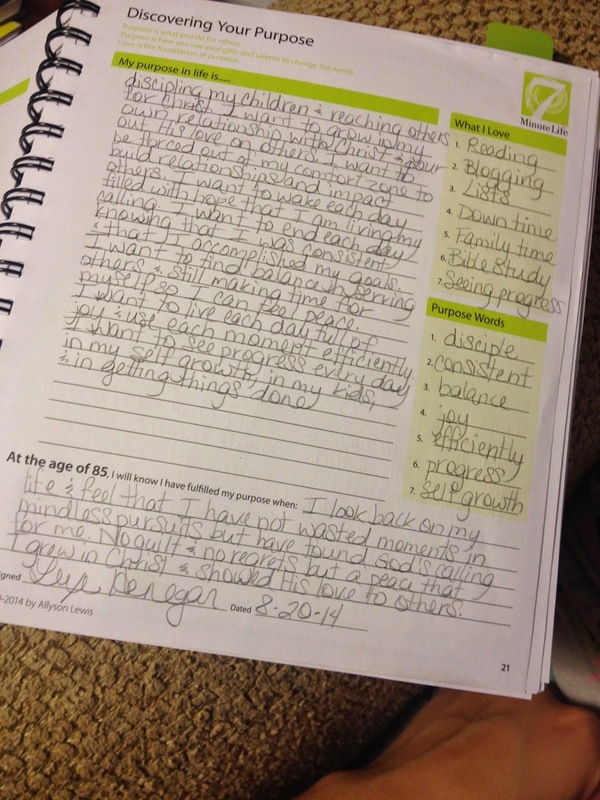 I loved that this planner focused not only on daily tasks but on you as a whole person. There were places to record sleep or eating habits. The pages had places to record connections you made with other people as well as thank you notes to write. This planner encompassed more than just a check list for each day. It helped me find my priorities and then set attainable goals to accomplish tasks that were important to me. It’s more than just a daily calendar; it includes ways to organize your thoughts and track your productivity. As I used this planner I found myself making many changes to the different sections. Instead of recording daily contacts as people I came into contact with each day, that section became a place to record my social media plan for the day. The section to record what I spent during the day served as the three lines that contained my meal plan. The thank you notes area was a place to record the 3 honey-do’s for my husband. Instead of a voice mail section, I used that as a place to write anyone who needed a response from me-whether via text, email, phone call, or social media message. In addition, the meeting planner pages in the front section became a place to write my daily plan for different social media outlets. I love how this planner takes you through the steps to prioritize, determine goals, and outline the manageable steps to achieve goals. 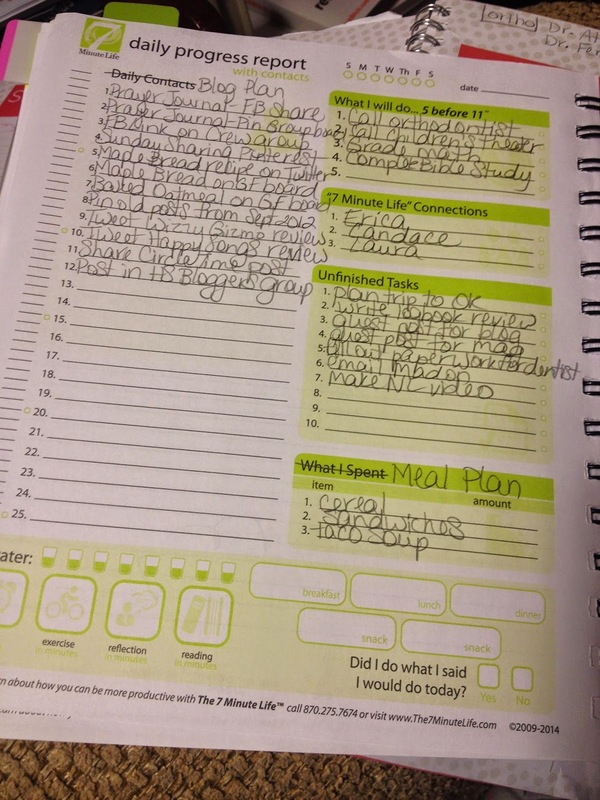 The planner includes places for checklists and sections to help you stay accountable in completing daily tasks. I found all of these areas so helpful in keeping me on task every day. However, I did find that I had to repurpose many of the sections in the planner since I do not work either outside the home or from my home. This made it more time consuming to use the planner. I still appreciate the ideas and principles behind the planning steps but wish the planner was available in a format that was geared more toward moms and household management rather than working individuals.